Hydrogen can be inadvertently added to Nitinol medical devices through electropolishing, caustic cleaning, or exposure to other acidic or basic solutions. Moderately high hydrogen concentrations can lead to embrittlement characterized by lowered ductility and changes in transformation behavior. 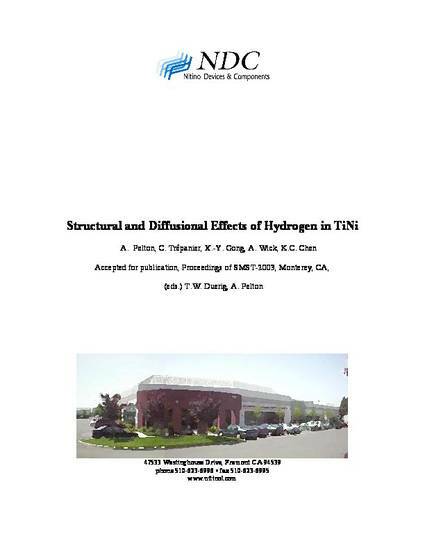 The purpose of the present report is to discuss recent results on the effects of hydrogen in annealed TiNi. Samples are charged with hydrogen and analyzed with x-ray diffraction; these data indicate that even relatively small amounts of hydrogen can affect the crystal structure. Additions of up to 1000 wppm hydrogen increase the atomic volume by more than 2%, decrease peak intensity and broaden peak width. These observations are consistent with hydrogen-induced lattice strain. Peak splitting and additional diffraction peaks are observed with the absorption of 6000 wppm hydrogen, which indicates formation of a new phase. It is speculated that the new phase may be based on the B2 structure or may be stress-induced R-phase or martensite. This paper also discusses experiments and analysis on the removal of hydrogen from TiNi wire with 800 wppm through heat treatments at 400-800°C for 30-3000 seconds. Extensive experimental and analytical computations show that the activation energy of hydrogen diffusion under these conditions is approximately 125 kJ/mol. This paper is made available as an electronic reprint with the permission of ASM International. One print or electronic copy may be made for personal use only. Systematic or multiple reproduction, distribution to multiple locations via electronic or other means, duplications of any material in this paper for a fee or for commercial purposes, or modification of the content of this paper are prohibited. The full conference proceedings can be found at http://asmcommunity.asminternational.org/.